Pendant is 3 1/8" x 2 3/4". The gold fill chain is approximately 28" long from the top of the pendant. 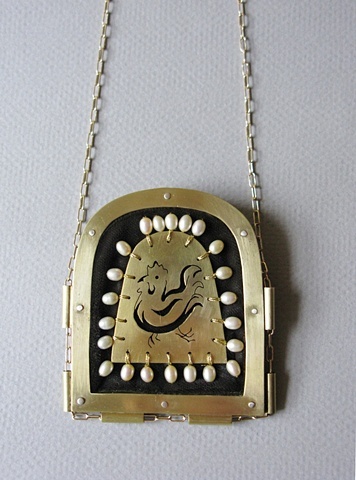 This large pendant features a hand pierced brass medallion of a dancing rooster, surrounded by freshwater pearls on a bed of luxurious dark green silk velvet. Like almost all imagery in the Middle Ages, art featuring animals were filled with hidden meanings and allegorical connections. The rooster (or cockerel) is a particularly naughty symbol of lust and lechery, sometimes paired with a rabbit (or coney) as the feminine counterpart. In 13th century Rome, a rooster was sacrificed every first Sunday during Lent as a way to purge lascivious desires. However, I choose to celebrate the cheeky rooster and the physical pleasures of life that it symbolizes!